2327 designers from 89 different countries participated. a design that addresses various points that the competition was seeking. the organic curve and natural wood finish portray some of the key messages that we would like to deliver through OLEDs. the ONA received many points for being among the top list in terms of feasibility for mass-production, without sacrificing the design factor. 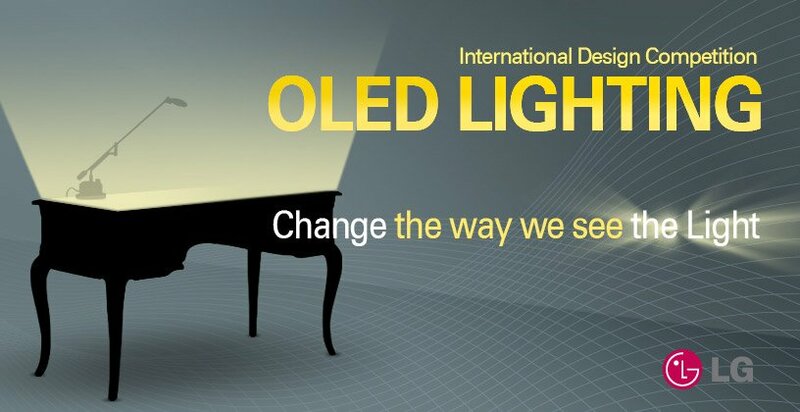 its combination with furniture was a great touch that showed one of the many possibilities of new OLED applications. among the finalists, the CANDLE family of lamps was among our favorites from a design perspective. it showed in a very unique way the natural characteristics of OLED light while emphasizing the uber-thinness of the panels. it is definitely a design that cannot be materialized through any other lightsource but OLEDs. furthermore, we also understand how difficult it is to blend an antique feel with a modern touch while maintaining a high level of aesthetics. this design received many accolades as well for considering the possibilities of mass production as well as expandability. it absolutely pained us to push this design to the runner up position, but ONA won out when it came to the production perspective. nonetheless, great job! the decision for this one was quite unanimous. the LAMBDA embodied many of the factors that this competition was looking for. it exemplifies the visual characteristics of OLED panels, especially the flexible ones, and it is easily transitionable to mass production. additional considerations have been put into the user interface options: while not a new idea, it does go well with the visual concept of the design. the colour options open up opportunities for colour marketing, as well as making the design expandable into different product families. last but not least, the LAMBDA is overall a well balanced, good design. we would be proud to have this design in one of our production pipelines someday. congratulations to all winners and participants! LG is currently conducting prototype testing of the winning designs as well as additional entries from the competition. as a result, the images of what they look like and a full competition results page will be available on designboom only in 2014.